Former GIS Research and Map Collection (GRMC) student-assistant Casey Gentis created a special map for a spooky October 2006 map display in Ball State University Libraries. 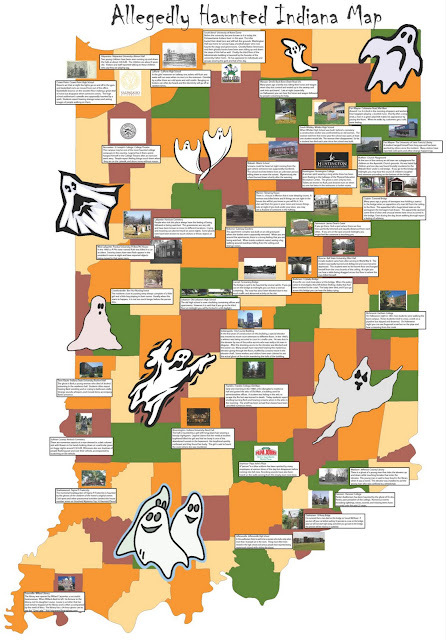 Gentis researched legends of haunted locations in Indiana and created a map of some of the sites. Former student-assistant Jenny Wyatt then re-created the map for digital format using Adobe Illustrator for a 2009 map display: Allegedly Haunted Indiana Map. The map is still a popular attraction of the Collection. Gentis discovered, interestingly, that most Indiana college campuses are allegedly haunted. The map features stories about locations at Purdue University, the University of Notre Dame, Indiana University, Valparaiso University, St. Joseph’s College, Huntington College, the University of St. Francis, Earlham College, Franklin College, Hanover College, and Ball State University. A prevalence of haunted libraries can also be viewed on the map. Allegedly Haunted Indiana Map is currently exhibited on the front windows of the GRMC on the second floor of Bracken Library. The map is also available in PDF-format from the University Libraries’ Cardinal Scholar repository at http://cardinalscholar.bsu.edu/handle/123456789/194225/. A map of haunted locations in the United States based on the Atlas of the Mysterious in North America from the Atlas Collection is also available from Cardinal Scholar at http://cardinalscholar.bsu.edu/handle/123456789/194229. The maps can be printed for display or research. For more information about these maps, please contact the GRMC at 765/285-1097.